What can I tell you today, then? The Big Thaw Continues, I guess. Oh, wait -- I did leave work an hour early yesterday so I could make it to the 3:30 showing I did not make it to the day before, at SIFF Cinema at the Uptown on Lower Queen Anne, of Capernaum, which was quite good. I hustled over there from work, walking for about ten minutes. There were maybe five minutes left of the trailers before the 126-minute movie began. I had hoped for the #8 to come by for me to ride home, but I wound up hopping on a Rapid Ride D bus down to Pike, where I then got on a #10, and walked home on 15th from the stop at Safeway on E John St. 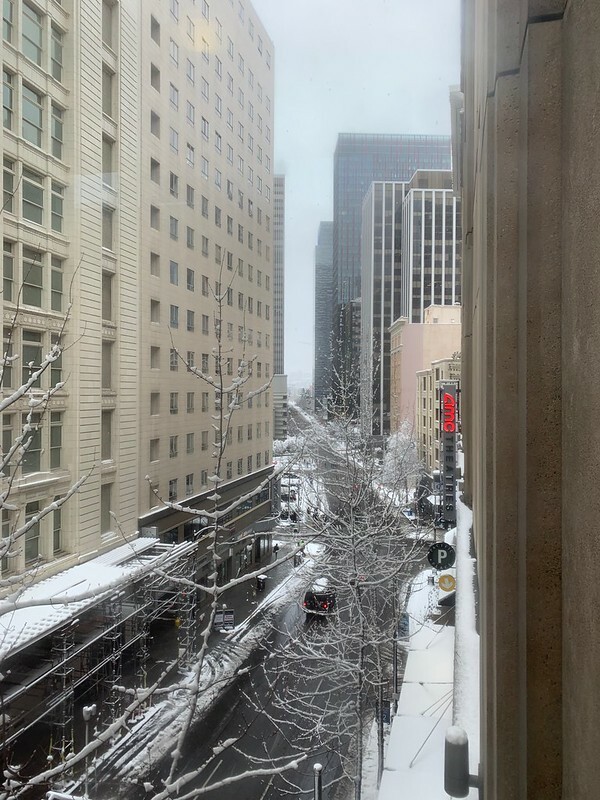 I was on that bus that I realized something I really should have figured out four days prior, about how King County Metro operates in the face of snow. Turns out, besides the #90 "Snow Shuttle" that only operates during snow, the #10 actually was my one and only option from downtown yesterday, and also the day before. Because Metro had their "Emergency Snow Network" (ESN) in effect. As it happens, ESN was in effect early Saturday morning (February 9) through Tuesday (February 12). Friday, remember, was when we had 6.4" of snow fall; an additional 1.5" by 9:45 a.m. Saturday (so starting the ESN Saturday morning at the latest honestly made sense); an additional 3.5" on Sunday and a whopping 6.1" more on Monday -- which was still working plenty hard to soften and thaw on Tuesday. Also, remember these are official numbers from SeaTac Airport, and snow levels varied significantly just between hilly neighborhoods of Seattle proper. 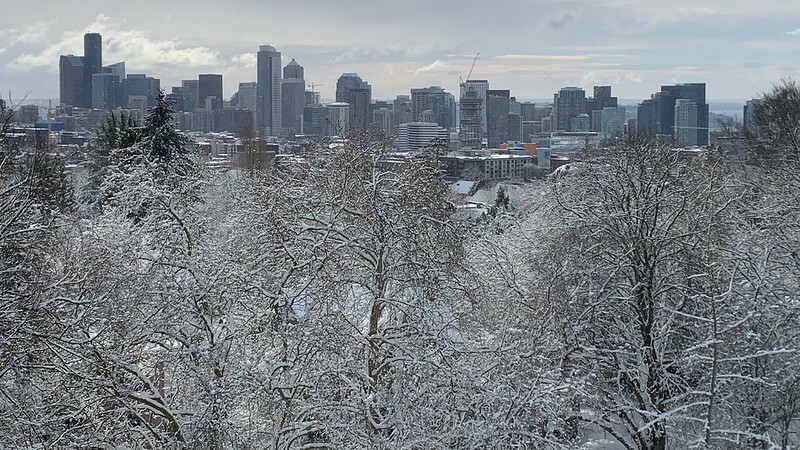 Also, the ESN is distinct from simply putting busses on snow routes, which is far more common, as Seattle snows are typically far less significant than these were. So, more than one day last week -- the first snowfall having been Monday February 4 -- had busses on snow reroutes. But once the ESN was in effect, and I figured out what that actually meant, finally I figured out -- yesterday, the last of the ESN days -- was that waiting for most of my usual buses off of Capitol Hill intow downtown was in vain. Literally the only bus I might ever use (and even that one I rarely take) that I still had as an option was the #10. When the ESN is in effect, service is significantly limited. A whole bunch of routes are scrapped altogether, and Metro's ESN web page features a list of the sixty routes that do run. It also features a map of all ESN routes and where they go. I actually saw that #90 "Snow Shuttle" running up Pine Street a few times over the weekend, and only see when looking at this map how wide its range is, and how inconvenient it really is as a "shuttle" up Capitol Hill from downtown proper: it may run up and down 3rd and 4th Avenues, but it goes all the way down south to Jackson before getting back up to Capitol Hill via Boren. So, although I could have caught the #90 from Pine & Boren the rest of the way to my building (right to it, in fact), the only bus that goes up Pike to Capitol Hill from the heart of downtown during the ESN is the #10. The #8 that usually goes down Denny; the #49 that comes down Broadway and then turns downtown down Pine; the #11 I can usually catch right at my building -- none of them run at all during the Emergency Snow Network. And, the ESN was still in effect even when I got out of my movie yesterday early evening, even though downtown streets by then were nearly completely clear. There was still plenty of snow left on Capitol Hill, though. I just hope I can perhaps remember this key information -- or perhaps at least think to look it up again, depending on how long it is between now and then -- the next time we have a series of snow storms like this. As I said though, more typically, it will just be snow reroutes rather than the ESN. Either way it's going to be a crapshoot whether I might as well just walk all the way to work. Today, as it happens, I lucked out and managed to catch two buses -- even with buses on snow reroutes! Shobhit drove to work today, after taking the bus yesterday as a precaution after getting stuck in the snow on Monday, and he texted me that the #11 was running. He must have passed one in his car. Well, it wasn't running on schedule, and it was on snow reroute, so I just walked down Pine for a while. When I got to Bellevue Ave, a #43 turned onto Pine, with a #10 right behind it. I really should have boarded the #10, but stupidly got on the #43 just because it was first. But I forgot that, unlike the 10, the 43 has no stop at Pine and 3rd, and I could not get off until it got all the way down to Union on 3rd. But, I walked one block north and then a rare thing occurred and a #1 bus came right up. I was able to ride that one up 3rd until it turned on Broad and I got off at the stop a couple blocks from work at 1st Avenue. I actually got into the office today at 7:33, which was quite early compared to my average over the past week and a half. So, I've kind of got mixed feelings about what lessons I feel I have learned. I'm only likely to put the lessons to use if there is another series of snow storms like this again soon enough for me to remember any of it. And that isn't likely. Oh well! If nothing else hopefully I'll have enough wherewithal to check what I wrote about it the last time (that being, from today's perspective, this time) it happened. I believe Metro should be on all regular routes again tomorrow. It got quite near 40° yesterday, and will again today. 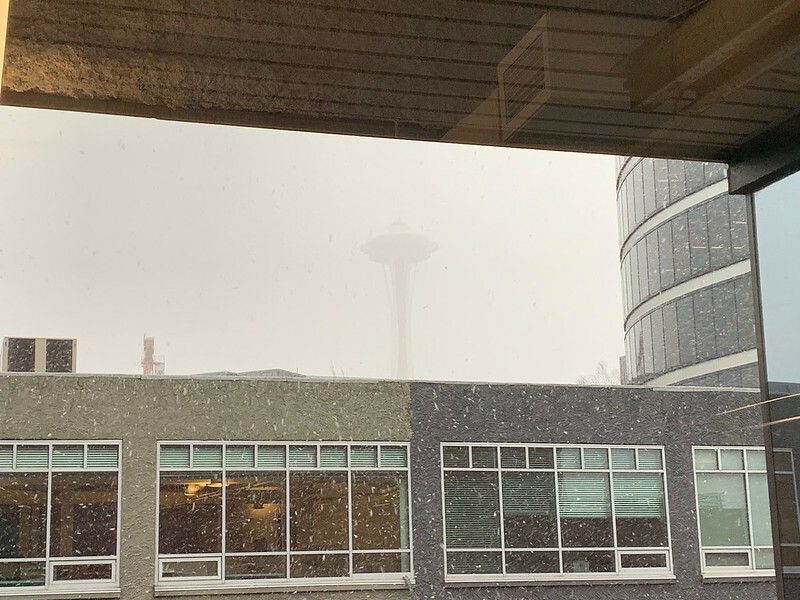 The thaw continues, with Seattle proper not being quite as treacherous as outlying areas that got much more snow -- snow weighted down with water from rainfall is making tree branches and even some roofs collapse. Yet more reason for me to be glad I live in a condo. Helen, our Floral Merchandiser, lives on Highway 8 just past Olympia, and insanely she commutes to work from all the way down there every day. Well, she didn't much over the past week. She made it today for the first time since probably Thursday. She's retiring in five months. Seattle Public Schools closed yet again today as well, today seeming a little ridiculous for them to do so, but I guess a lot of side streets are still a mess. This was the second or third time Noah brought his young daughter to work with him. I feel bad for the kids who will have to make up all these school days at the end of the year -- and, I read recently, in some cases even on a couple of Saturdays. God, I'm glad I'm not in school anymore.